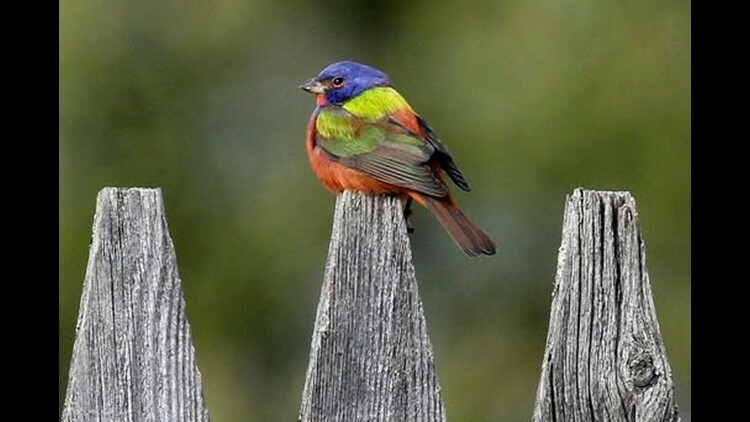 MONTPELIER, Vt. (AP) — Bird watchers have flocked to a small town in Vermont hoping to catch a glimpse of the painted bunting, a rare bird described as a "flying rainbow" that normally doesn't fly north of the Carolinas on the East Coast. It's the sixth time since 1993 a painted bunting has been recorded in Vermont, said Kent McFarland, a conservation biologist with the Vermont Center for Ecostudies, who photographed the colorful bird on Friday. "It's a flying rainbow. It's a really bright bird," he said of the tennis ball-sized bird that has appeared in a yard and at a feeder in Pittsfield. McFarland said the painted bunting really sticks out in Vermont's early spring brown landscape. "It's a beautiful, beautiful bird. It's like tropical when you look at it," he said Wednesday. The last time the male painted bunting was spotted in Pittsfield was on Sunday. The species breeds in the south-central and coastal southeastern parts of the country. It's known for shooting northward at odd times but it's hard to say why, McFarland said. One was spotted in western Maine during a Christmas bird count and another in Brooklyn, New York, in November. In most falls and winters, there are usually one or two painted buntings that show up somewhere in New England but they tend to be females, which are bright green rather than technicolored like the males, said Geoff LeBaron, director of the Christmas Bird Count for the National Audubon Society. "In any given species that migrates, there's a certain proportion of the population that's going to go 180 degrees in the wrong direction," he said. Painted buntings are more noticeable than some of the other birds out of range because of their plumage and visits to feeders because they're seed eaters, he said. It seems "very unlikely" that the bird in Vermont was a pet that was released from captivity, he said.